A New York gal living in Sydney. An ICU nurse by profession and urban hippie. A pescatarian, runner/yoga lover, scuba diver & green-living enthusiast. Admits to being a coffee snob & is owned by a sweet French Bulldog. I recently was invited to the Moonlight Cinema Pop Up Picnic and Program Launch for the 2014/15 season. 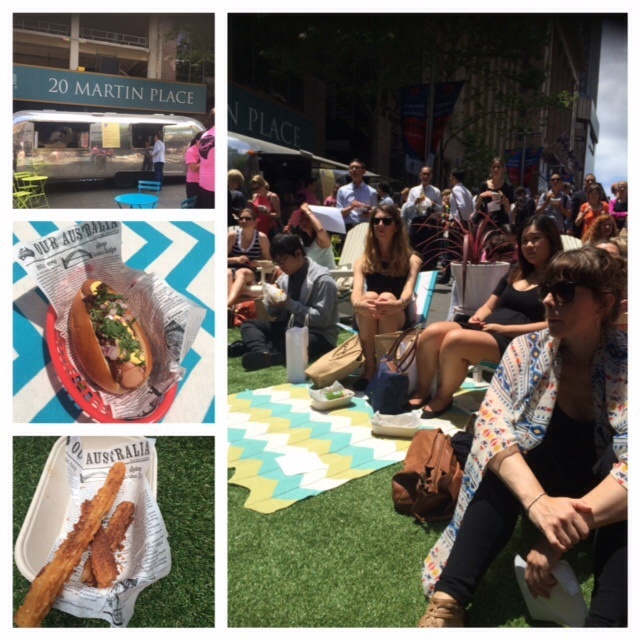 It was such a lovely afternoon as a section of Martin Place was turned into a grassy picnic spot complete with astro turf, picnic blankets, pillows, lawn chairs and food. Lucky peckish picnickers were served up baskets of street food from the on-site LA style food truck. We got to taste the menu for what movie-goers will be nibbling on this summer in Centennial Park. Instead of your usual movie popcorn, expect to sink your teeth into Buffalo fried chicken, New York chilli cheese dogs, wagyu beef cheeseburgers, fresh churros and other Americana inspired food. As always, you can opt to BYO food and booze or head to the food truck. 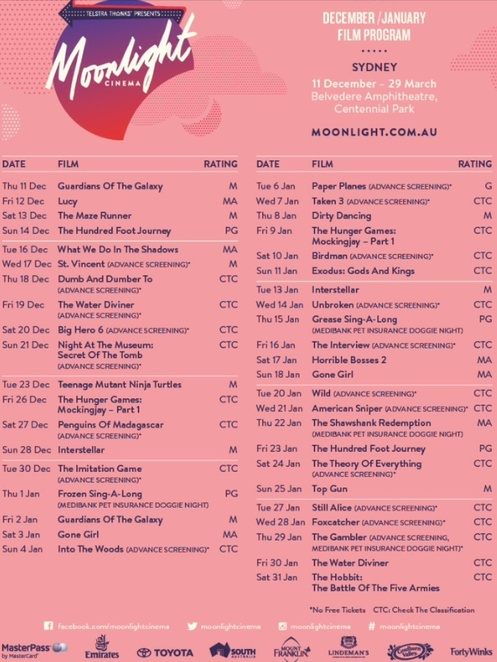 While tucking into our street food, Ian Sutherland the Director of Moonlight Cinema introduced us to this upcoming season. According to Sutherland, "We're very proud of this program and excited to be screening so many big summer blockbusters before their general release dates. It certainly adds an extra level of thrill and enjoyment to watching a film outside under the stars, knowing that you're amongst the first audience in Australia and sometimes, even the first in the world, to be seeing it!" So cue the opening credits and let me unveil to you the advanced screenings, blockbusters, new releases, cult classics, children's films, doggie nights and sing-a-long sessions for this summer program. I am just so excited to tell you about all the advanced screenings on offer, it's going to be a huge season. To start off, Moonlight Cinema's official launch will be a star-studded VIP event, where yours truly (that's me) will be walking down the red carpet to watch the exclusive advanced preview of Dumb And Dumber To. It's been 20 years since we last saw these loveable dimwits and their furry dog van. 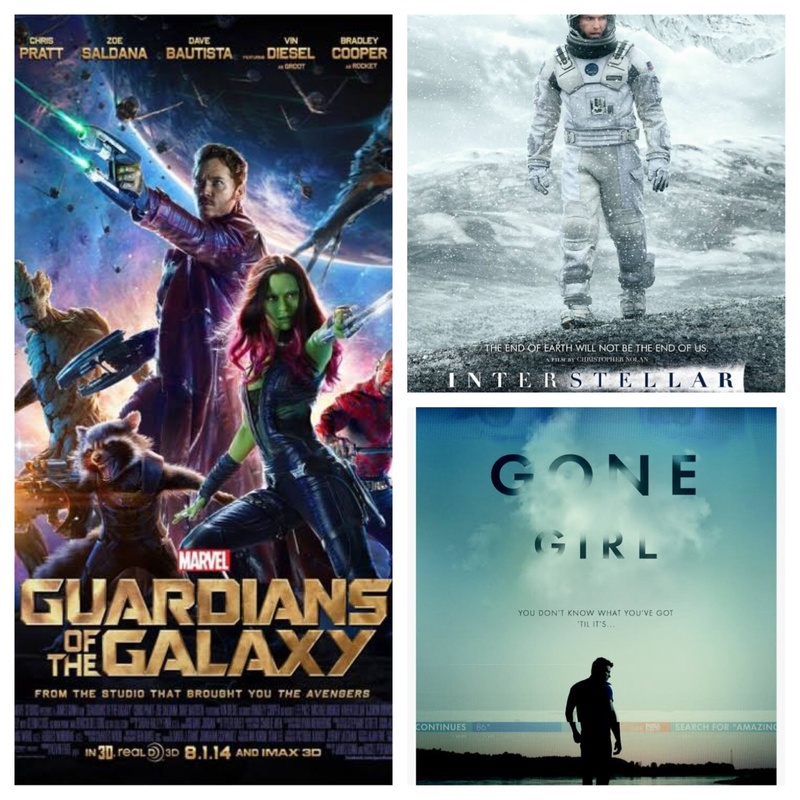 Other amazing advanced screenings this summer will be stellar. They include the indie film St. Vincent starring Bill Murray, The Imitation Game, about the life of a WW2 codebreaker with Benedict Cumberbatch, Unbroken directed by Angelina Jolie and Taken 3 with Liam Neeson returning as ex-covert Mills. Also joining the advanced previews will be The Interview starring zany Seth Rogen in a plot to assassinate a North Korean dictator, Wild is the true story of one woman's journey with Reese Witherspoon in the lead role, while American Sniper with Bradley Cooper is based on the autobiography of Chris Kyle. The Theory Of Everything, with Eddie Redmayne playing the role of Stephen Hawking will interest cinephiles and Kristen Stewart with Julianne Moore team up in the drama Still Alice. 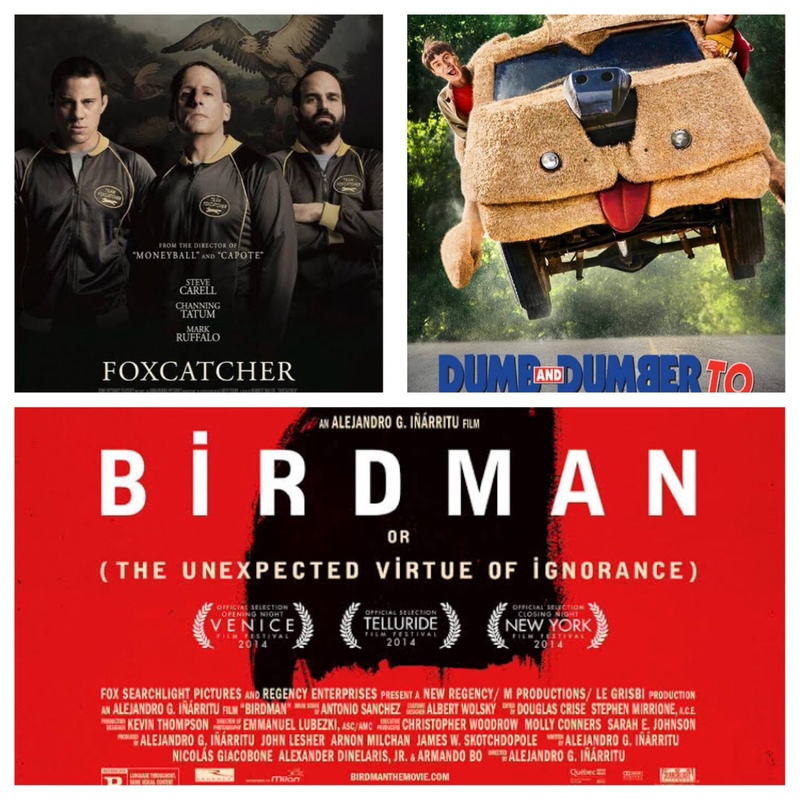 The advance screening films that you will see before they even hit the cinema continues with the yummy Channing Tatum and an unrecognisable Steve Carrell in Foxcatcher, then there's the remake of the 1970's film The Gambler with Mark Wahlberg in the lead and Michael Keaton returns to reclaim his past glory in Birdman. The musical Into The Woods with ever quirky Johnnie Depp will delight audiences of all ages as well as Big Hero 6, Night At The Museum: Secret Of The Tomb and Penguins of Madagascar. Australian movies, The Water Diviner directed by and starring Russell Crowe will be shown Australia Day. Also Paper Planes set in the Australian outback stars Sam Worthington. Mark your calendars as that is a HUGE lineup of advanced screenings! Does your pooch like to watch television like mine does? Well now your previous pup can accompany you to Medibank Pet Insurance Doggie Nights at Moonlight Cinema. Every Thursday in January and every second Thursday in February and March you can bring along your movie loving dog! There are some rules such as being quiet and kept on a short leash, etc. Please check the website to see if your fur-baby is film friendly. Provided that your canine has good singing/howling skills as well, he or she can come along to Thursday's Sing-A-Long flicks of Frozen and Grease. 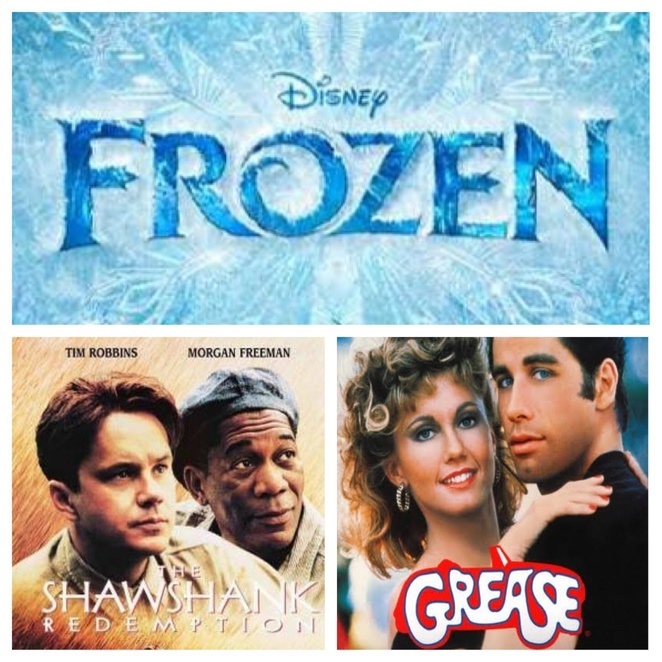 Thats right I know you just started singing "Summer lovin had me a blast..."
New releases that perhaps you just missed in the theatre or are waiting to see under the stars, this summer is your chance to catch Guardians Of The Galaxy, Lucy, The Maze Runner, The Hundred Foot Journey, What We Do In Shadows, Teenage Mutant Ninja Turtles and Exodus: Gods And Kings . For those that love these series of books and movies, The Hunger Games: Mockingjay - Part 1 and The Hobbit: The Battle Of The Five Armies will be shown. I pray I don't find out the endings to Gone Girl and Interstellar until I finally get to see them for myself at Moonlight Cinema. Ever popular cult classics will be back on screen. "Nobody puts Baby in the corner"...you know it, Dirty Dancing will be shown this January. Bring your besties to The Shawshank Redemption...is there anyone who does not love that movie? Top Gun will take you right back to the danger zone and why not come dressed up to The Rocky Horror Picture Show. To add to your comfort, you can rent a bean bed for $9...first in and best dressed gets one as these sell out quickly on the night. Perhaps you're after a little luxury, then the sectioned-off 'Gold Grass' VIP area is for you. For $35 you get a reserved bean bed, waiter service and the best view in the...errr...house. How's that for a summer movie lineup? And that's only half the season! So think about which friends to invite to the Sing-A-Longs and what movie previews to see that will make your mates jealous. There truly is something for everyone, including the family dog.